Zack Burt is an American computer programmer. He founded Code For Cash, the tech recruiting firm. This article shares some practical processes that you can add to your human resources function in order to accelerate the programmer pipeline, based on the years I have spent as a hiring focused software engineer at growing startups and now running my own recruiting firm. Our recruiting strategy is surprisingly simple, and boils down to optimizing various segments of the sourcing funnel: awareness, pageviews, and application submits. What ties these tactics together, though, is you, your company, what you’re offering, and how you approach the people you want to hire. If you want to build a strong, diverse team, you need to develop a thoughtful, empathetic and proactive approach before you can optimize. In the article’s appendix, I also provide our company’s 2019 checklist process — eighteen steps that we delegate to manage our sourcing process. As Slack gathered with its growing customer base this week at the Frontiers Conference in San Francisco, it announced several enhancements to the product, including extending collaboration to folks who want to stick with email instead of hanging with their co-workers in Slack . Some habits are tough to break, and using email as your file-sharing and collaboration tool is one of them. Email is great for certain types of communications, but it was never really designed to be a full-fledged communications tool. While a tool like Slack might not ever fully replace email, it is going after it hard. But Andy Pflaum, director of project management at Slack, says rather than fight those folks, Slack decided to make it easier to include them, with a new email and calendar bridge that enables team members who might not have made the leap to Slack to continue to be kept in the loop. Instead of opening Slack and seeing the thread, the message will come to these stragglers in their trusty old email inbox, just the way they like it. Earlier this month the company announced tighter integration between Slack and Outlook calendar and email (building on a similar integration with Gmail and Google Calendar), where emails and calendar entries can be shared inside Slack. Pflaum says that the company is trying to take that email and calendar bridge idea one step further. The non-Slack users would get an email instead with the Slack thread. It bundles together multiple responses to a thread in which the person has been engaging in an email, so the recipient isn’t getting an email for every response, according to Pflaum. The person can respond by clicking a Slack button in the email and having Slack open, or they can simply reply to the email and the response will go to Slack automatically. If they choose the former, it might be a sneaky way to get them used to using Slack instead of email, but Pflaum says that it is not necessarily the intent. Slack is simply responding to a request by customers to have this ability because apparently there are a percentage of people who would prefer to continue working inside email. The ability to open Slack to reply will be available soon. The ability to reply to Slack with the Reply button will be available later this year. Microsoft reported its quarterly earnings for Q3 2019 today. Overall, Wall Street expected earnings of about $1 per share and revenue of $29.84 billion. The company handily beat this with revenue of $30.6 billion (up 14 percent from the year-ago quarter) and earnings per share of $1.14. With Microsoft focusing heavily on its cloud business, with both Azure and its other cloud-based services, it’s no surprise that this is also what Wall Street really cares about. The expectation here, according to some analysts, was that the company’s overall commercial cloud business would hit a run rate of about $38.5 billion. Those analysts we’re off by only a tiny bit. Microsoft today reported that its commercial cloud run-rate hit $38.4 billion. 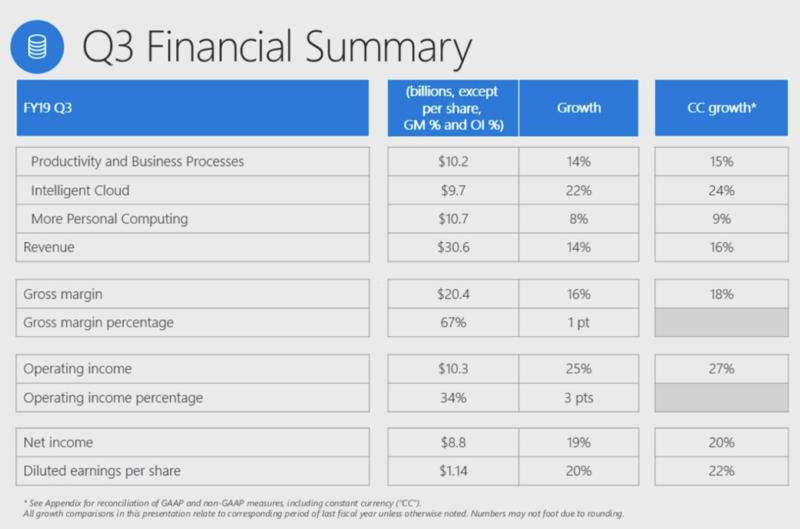 And indeed, Microsoft Azure had a pretty good quarter, with revenue growing 73 percent. That’s a bit lower than last quarter’s results, but only by a fraction, and shows that there is plenty of growth left for Microsoft’s cloud infrastructure business. Azure’s growth slowed somewhat in recent quarters. In some ways, that’s to be expected, though. Microsoft’s cloud is now a massive business, and posting 100 percent growth when you have a run rate of almost $40 billion becomes a bit harder. The company’s “intelligent cloud” segment, which includes Azure and other cloud- and server-based products, reported revenue of $9.7 billion, up 22 percent from the year-ago quarter. Microsoft’s productivity applications also fared well, with total revenue up by 14 percent to $10.2 billion. Here, revenue from LinkedIn also increased by 27 percent and the company highlighted that LinkedIn sessions also increased 24 percent. Other highlights of the report include an increase in Surface revenue of 21 percent, which was expected, given the number of new devices the company released in recent quarters. “Leading organizations of every size in every industry trust the Microsoft cloud. We are accelerating our innovation across the cloud and edge so our customers can build the digital capability increasingly required to compete and grow,” said Satya Nadella, CEO of Microsoft. For more financial details, you can find the full report here.